Congratulations to the winners and all tournament entrants. I hadn’t been a member of the club long when I asked Dave Mustard whether he ever got sick of coaching. It’s the sort of provocative question we hacks like to pose as it often gets the sort of interesting answer that elevates a run of the mill piece into something special. But I didn’t have a journalistic assignment, nor a microphone in my hand, but was making small talk. Dave looked at me as if I was a cretin and responded rhetorically: “So how do you earn your living?” and stormed off. There's nothing quite like a game of tennis down at HBPRC on a hot, sunny day. So dig out that old toweling headband and jump on one of our 4 AstroTurf courts. When you're done, you can sit back and enjoy a nice cool drink on the deck. The first thing to do is show up at club night (Thursdays from 6:30pm) Our tennis coaching professional will get you out on court for a game of singles or doubles with someone of similar ability. Afterwards join us for a refreshing beverage on the deck. When's the best time to play? The short answer is weekdays when most people are at work. But if you're stuck in the same boat don't fret - the floodlights kick in at dusk and stay on till 10 every night (except Sunday). Before coming over, you might want to check the court bookingn system to make sure there's a court free. Better still make a booking. Can I bring a mate who's not a member? Sure, as long as you play them outside peak hours (4pm - 8pm) and remember to pay the visitor's fee . After 3 visits you should probably start dropping a few hints about becoming a member too. Fill in one of the visitor's fee envelopes outside the club office, stick in $20 per person (max $40 per court) for every hour played, then leave it with the barman or slip it under the door of the club office. I've just come back from 3 years in the Himalayas. Who am I going to play? David Mustard our Head Professional runs a full programme. Is professional coaching really worth it? Hell yes! Even if you're not gunning for Wimbledon, a few lessons can help eliminate those constant unforced errors that drive most of us round the bend. 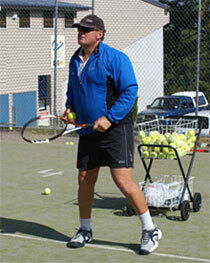 Our resident tennis professional, 80's Davis Cup sensation David Mustard, certainly knows his stuff. What's more, he's a funny guy so you'll still be smiling when the training gets tough. David can be contacted on 021 476 606 or send him an email or visit his website. Come along and learn how to play Tennis. Call David directly on 021 476 606. Keep up to date with all the results here. Follow your team's draws and results here. Click here for info and video.